So I have a confession: I am slightly obsessed with Jen Hatmaker’s writings: her blogs, her books, and now… her recipes. For those of you may not know of this awesome woman, you can read her blog and become obsessed as well. Her first book that I read was 7: An Experimental Mutiny Against Excess, and I’ve been hooked ever since. She has a way with words: humorous, raw, authentic, and her writing will touch your soul (and now tastebuds). Go check her out at jenhatmaker.com and you can thank me later. Anyho, this tomato sauce recipe came from her website and I just tweaked it to my preferences. This is a big batch of sauce (enough for 4 pizzas or multiple pasta dishes) so you can use some now and freeze the rest for later. Also, it’s so versatile you can use it for any dish calling for a tomato sauce: pizza, spaghetti, lasagna, baked ziti… Are you hungry yet?! Seriously, try this sauce out and I guarantee you’ll always keep your house stocked with it! 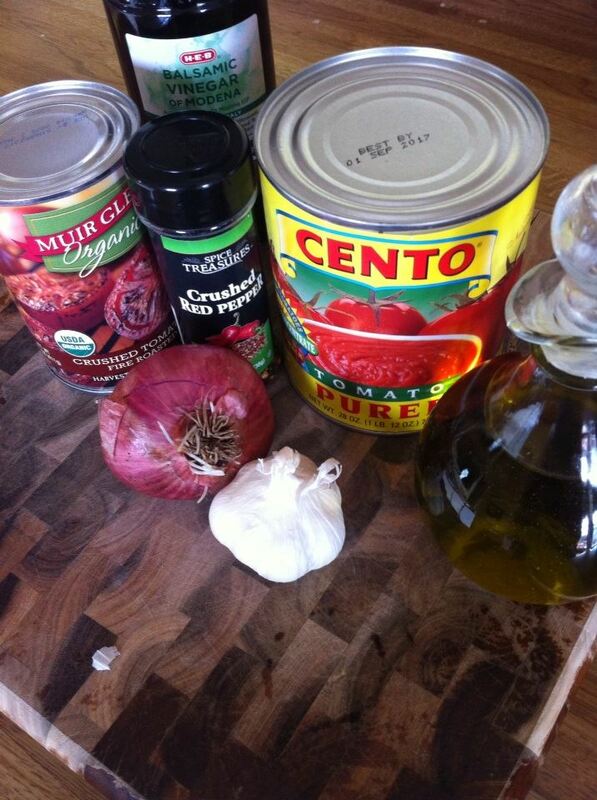 • In a medium sized pot on low heat warm the olive oil, red pepper flakes, onion and garlic. Cook about 4 minutes. Your nose will know when it’s done, it smells so good! • Add the remaining ingredients and whisk until the olive oil is incorporated. • On low heat, let the sauce simmer for at least an hour. • Taste throughout the hour and add more seasoning, if needed. • After an hour feel free to use on the Italian dish of your choice! • I learned while making this dish balsamic vinegar has different leaf ratings. When I was buying the ingredients, I just got the 1 leaf because it was cheaper, but I came with a sample for 4 leaf… Y’all, I could drink that 4 leaf out of the bottle… But I didn’t, mainly because I only had a sample which I used for the recipe. I gotta tell ya, after sampling the 4 leaf that is all I am going to use from now on. Try it! • I only used 1 teaspoon of the red pepper flakes, but the original recipe calls for 1 tablespoon. I strongly suggest if you’re not worried about burning your little toddlers tongues to use the whole tablespoon. • In my picture, next to the sauce there’s my homemade dough rising, also from jenhatmaker.com. I followed that recipe exactly so if you’re looking for a pizza dough recipe to go along with the sauce, check out her website. • Again, this is super basic and versatile. You can adjust it to the dish you’re making or add your favorite herbs and seasonings to come along for the ride. 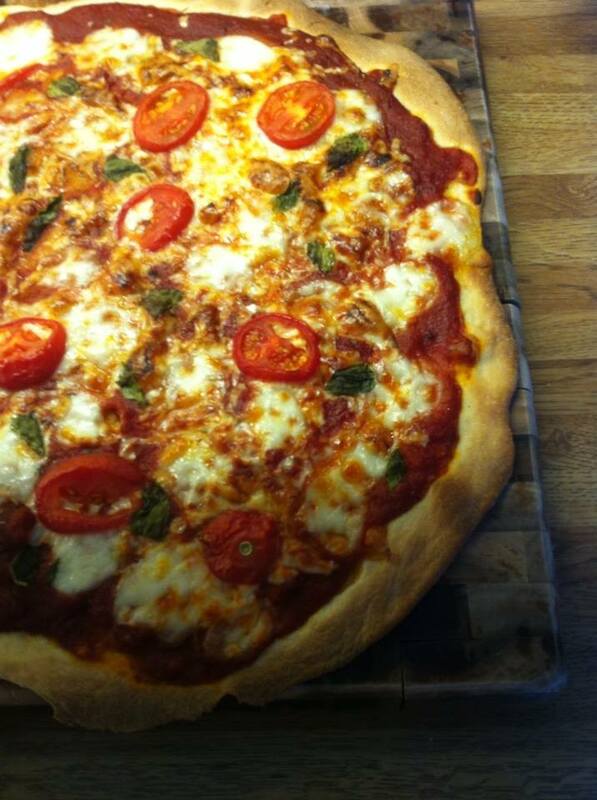 Here’s a picture of the pizza I made. It was AMAZING. 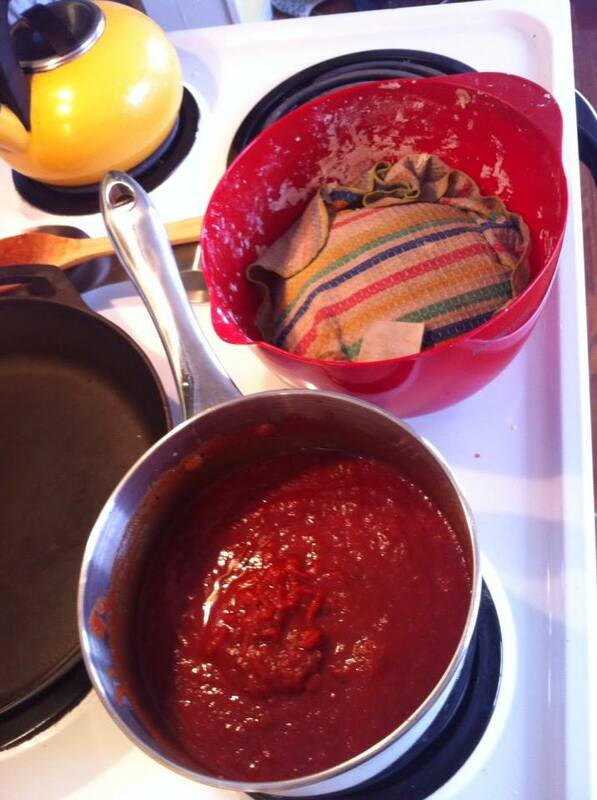 Have you been looking for an amazing pizza sauce recipe? What other recipes could benefit from this sauce? I’ve been looking for a good sauce recipe! I will have to try this! I have been looking dor a puzza sauce recipe! Thanks a bunch! Oh and feel free to come over and make pizza at my house anytime! Can you come fly to Cali & make this for a prego lady craving ALL things tomato & Italian?? ?